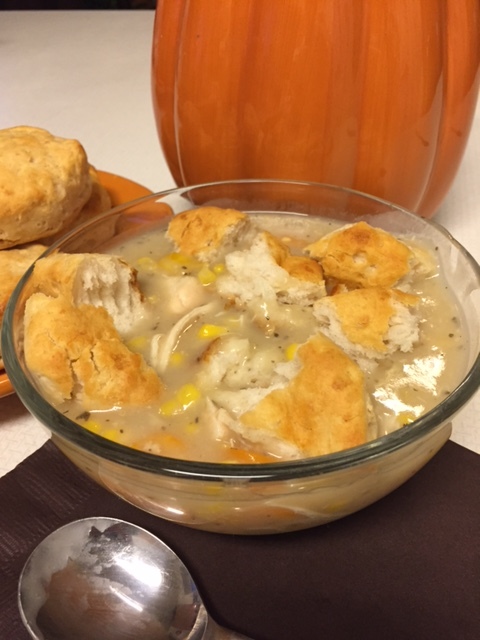 Chicken & Biscuits, a perfect warm comfort meal for a cool fall day! Heat 4 cups of water to boiling and dissolve the 4 chicken bullion cubes in the hot water. Place the bullion water into a crockpot and add three cups of hot water. Stir in the two envelopes of chicken gravy. Remove Bay Leaves and add Salt & Pepper to taste. Bake the Biscuits according to the package directions. Serve in a bowl with a broken biscuit on top. Enjoy the warm, comfortable goodness!! « Comic Con Birthday Cake!